The skirt, for centuries the defining feminine garment in Western fashion, can be expanded to increase the wearer's apparent size and thereby her importance and dignity. Skirts are often given volume by cloth petticoats, but stiffer structures are more effective and may be lighter and more comfortable; when exaggerated, however, these supports can become amazingly encumbering. 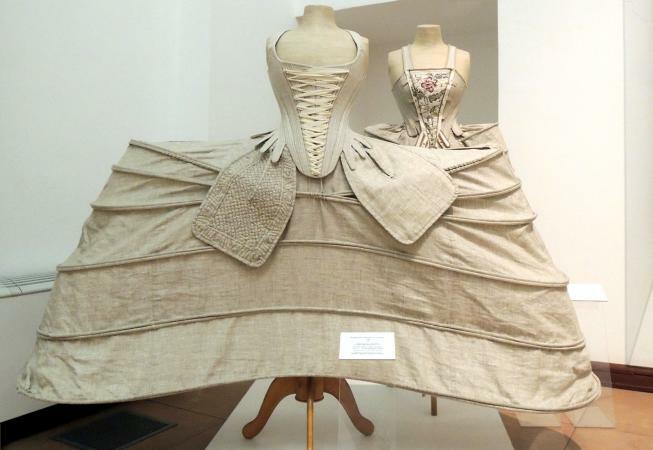 Skirts have been supported at the back by bustles, while extended skirt circumferences have been produced by farthingales in the sixteenth and early seventeenth centuries, paniers in the eighteenth century, and crinolines or hoop skirts in the mid-nineteenth century. Around 1470, fashionable Spanish women began to hold their skirts out with bands of heavy cord or rope in casings on the outside of their skirts. From this, a separate hooped underskirt developed that abstracted a woman's legs into a seemingly motionless cone shape. By the 1540s this fashion had spread to other countries, including England, where it was known as the verdingale or farthingale, derived from the Spanish verdugo, a type of flexible twig also used as hoops for skirts. This conical skirt, called the Spanish farthingale, stiffened with whalebone, wire, or other material, became very wide in the early 1580s. 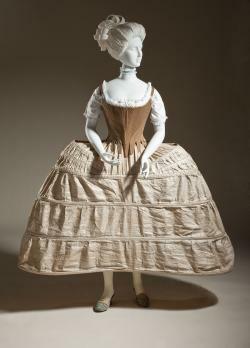 About his time, women's hips began to be augmented by padded rolls, altering the skirt silhouette into a shape termed the French farthingale. By the 1590s, French farthingales could take the form of a wheel or drum that held the skirt out from the waist at right angles. Exclusive to the upper classes, these supports magnificently displayed rich, heavy skirt fabric, which, as authority Janet Arnold shows, was fit in place by a servant who pinned in a horizontal fold to form a ruff-like flounce at the top of the skirt. Farthingales began to go out of fashion in England in the late 1610s, but the style lasted somewhat longer in France, and as Spanish court dress it continued into the 1660s. The wish to distend the skirt returned in the early eighteenth century. By about 1710, fashionable skirts were supported by devices called hoop-petticoats or hoops in England and paniers (baskets) in France. These structures were at first dome-shaped, but by mid-century were usually flattened front to back into an oval or took the form of separate side or "pocket" hoops; they were typically of stiff fabric reinforced by hoops of whalebone, wood, or cane, but could be open frameworks of metal or other material. Hoops were usually modestly sized for informal wear, but often reached over six feet from side to side for formal occasions, necessitating some skillful maneuvering such as going sideways through doors. While large hoops were labeled monstrous by some, others believed they gave women elegance and grace, and ensured each was physically distinct. Extreme hoop-petticoats also distinguished the elite who wore them, functioning, according to Henry Fielding, as an "Article of Distinction" between classes. Although they were going out of style by the 1770s, large paniers continued to be de rigueur at the French court until the revolution of 1789. Just as the earlier farthingale had fossilized as Spanish court dress, side hoops were retained until 1820 at the English court, worn anachronistically with high-waisted neo-classical dresses. Skirt supports may have been intended to bestow dignity and grace, but the result was sometimes antithetical: in The Art of Dress (p. 123), Aileen Ribeiro cites an early nineteenth century observation that a behooped lady stuffed into a sedan chair "does not ill resemble a foetus of a hippopotamus in its brandy bottle." See also Bustle; Crinoline; Skirt. --. Queen Elizabeth's Wardrobe Unlock'd Leeds, U.K.: W. S. Maney, 1988. C. Willett And Phillis Cunnington. The History of Underclothes. London: Michael Joseph Ltd, 1951 (new edition revised by A. D. Mansfield and Valerie Mansfield published in London by Faber and Faber, 1981). Ewing, Elizabeth. Dress and Undress : A History of Women's Underwear. London: Bibliophile, 1978. Ribeiro, Aileen. The Art of Dress: Fashion in England and France, 1750-1820 New Haven, Conn., and London: Yale University Press, 1995. --. Dress in Eighteenth Century Europe, 1715-1789. London: B. T. Batsford, 1984.